Fiber lovers would love to receive a 1) 4 oz braid of hand dyed fiber from By Melody ($19). This over-dyed grey Blue Faced Leicester will spin up like a dream! Give the gift of felting with our new 2) Gnome ornament felting kit ($15) Gnome-lovers ages 8 and up can learn this fun and easy craft with our amazing kits! Our new 3) Cross Stitch Ornament kits ($18) have everything you need to whip up a modern cross stitch ornament complete with wood hoop for hanging. We have four different colorways to choose from to please everyone - you can also buy them on our etsy shop! 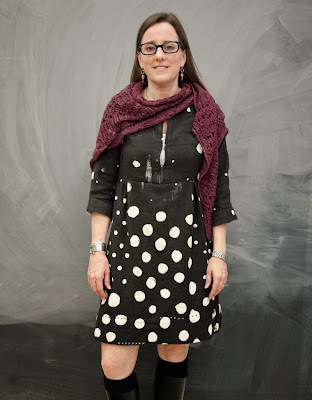 Sewists fell in love with April Rhodes Staple Dress pattern this year and now we are also stocking her newest pattern, the 4) Date Night Dress ($18). Any new or experienced seamstress would love to have this classic yet simple design. 5) Nail Polish. ($16) That's right, nail polish. We have four special 4-packs, each designed by a different fabric designer like Lizzy House and Denyse Schimdt - the perfect gift for any fabric lover! Kids and adults alike will fall in love with the adorable designs of 6) Kiriki press embroidered animal kits ($18.50) Choose from Bear, Sloth, Fox, Cat, Bunny, and Owl. Stay tuned next week for our staff picks! For the crafter in your life who has been extra nice this year, we have the under $50 gift guide. 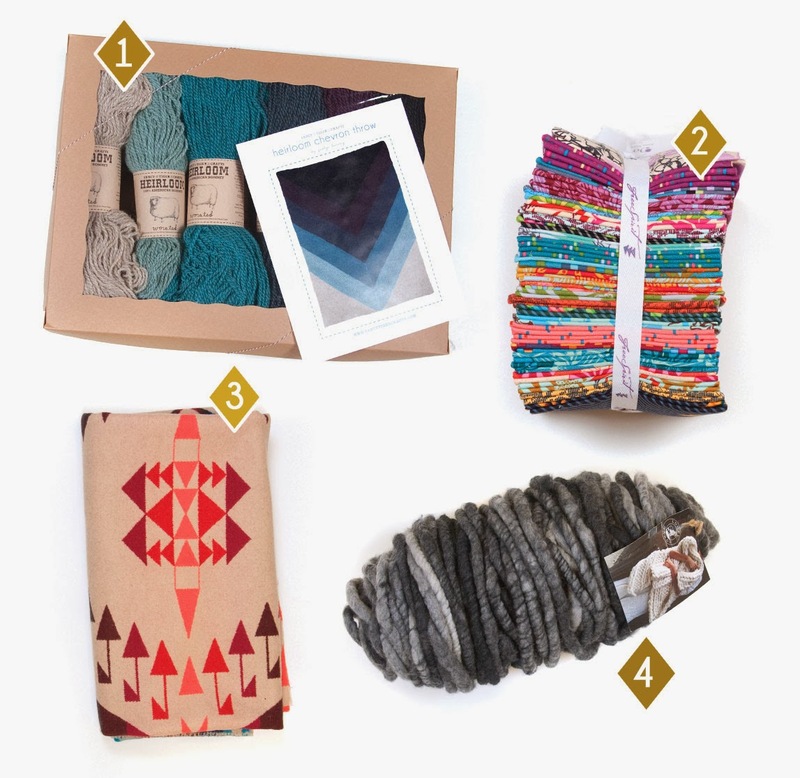 These gifts range in price from $21 - $50 and we think you'll find something for everyone on your list. The 1) Ryan Berkley tool case ($30) from Sublime Stitching comes stocked with needles, scissors, and woven labels--and almost every stitcher will love the Ryan Berkley cats in tees cover! 2) Quilt Essential ($25.95) by Erin Harris is our new favorite go-to book for anything and everything quilting. New quilters will love to have this in their library. These beautiful 3) woven baskets ($24 - $44) are the perfect solution to storing your current project out of sight and out of the wrong hands or paws. Made from grass and recycled wire and available in a variety of shapes and sizes, these baskets add charm and style to a room while keeping projects tidy. 4) Two skeins of our Heirloom Romney yarn and our Imposter's shawl pattern ($46.50) would be the perfect gift if you want to spread your Fancy Tiger love to all your knitter friends. 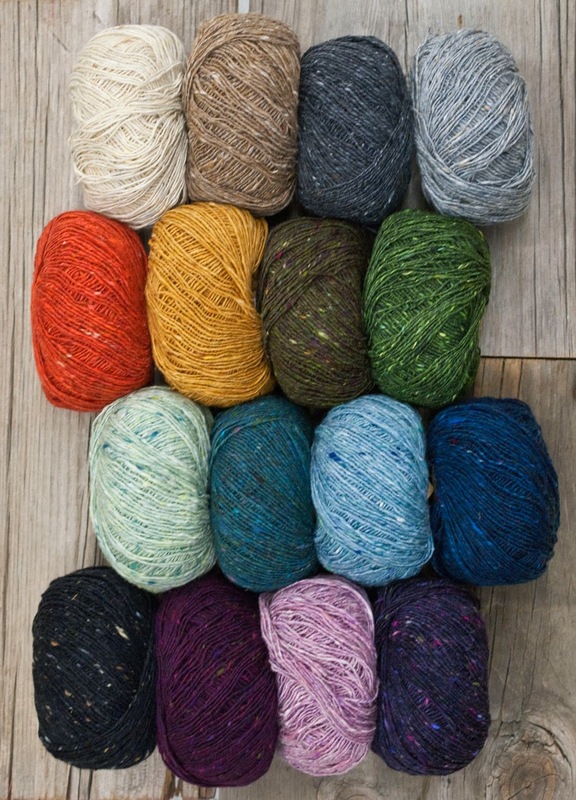 Knitters and crocheters alike will go gaga over the 5) Freia lace weight ombré yarn ($33). One skein of this color-changing magic is enough for a shawl or other small project. 6) Modular Modular project bags ($27 - $30) are the most unique gift for your yarn friends - they are handmade here by our very own, Katy, all in different and awesome fabric combinations. We love these letterpress posters from Fringe Association. All fiber lovers will hang this 7)Yarn Pyramid poster ($22) with pride. 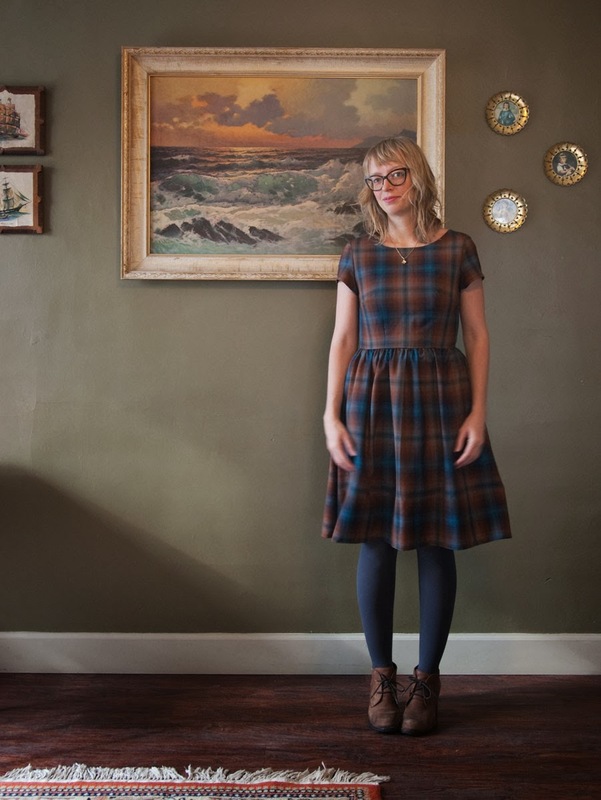 A one yard cut of 8) Pendleton shirting weight wool ($33/yd) is enough fabric to make a beautiful wool skirt or poncho - the perfect gift for your favorite sewist. 2013 Holiday Gift Guide: Extra Special Gifts! 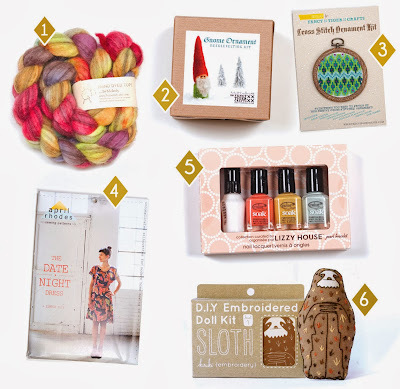 It's that time of year again where we round up the latest and greatest in amazing craft supplies for our Holiday Gift Guides! This year we're starting with the extra special gifts you might consider for the most special crafty person in your life. For the knitter who loves wool we have the amazing 1) Heirloom Romney Throw kits ($234). These amazing kits come with 12 skeins of US produced and milled Heirloom Romney yarn to make a large and luscious 72" x 54" knit throw and a high quality print pattern designed by Jocelyn Tunney. Each kit has 2 skeins each of 6 colors handpicked by us in four colorways inspired by the seasons. 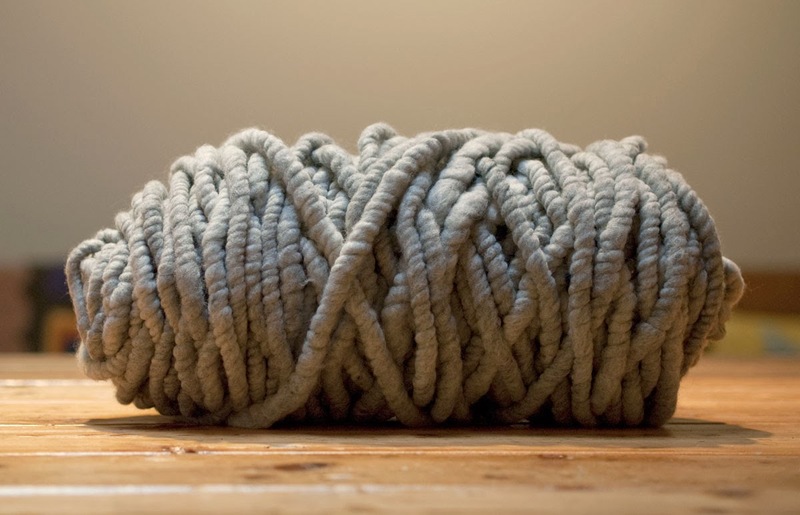 The Heirloom Romney yarn will wear great and look amazing for years to come. Winter is shown here--check our etsy store to see all four colorways. 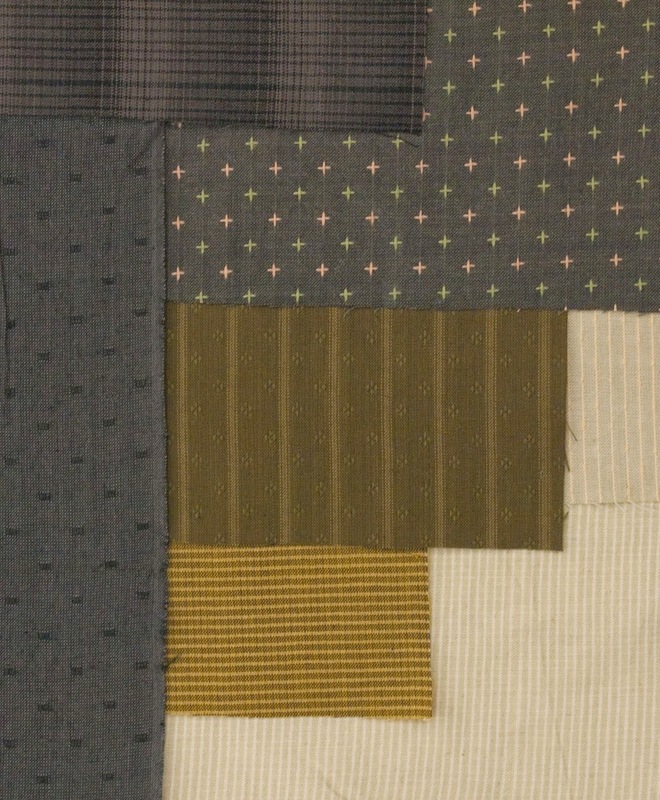 Any quilter would rejoice to receive a 2) fat quarter bundle of Anna Maria Horner's newest collection, Dowry ($100). This set features all 30 prints and is enough to make a queen sized quilt top. For the sewist who loves wool the obvious choice is the coveted and luxurious 3) Pendleton Wool Jacquard fabrics ($80/yd). 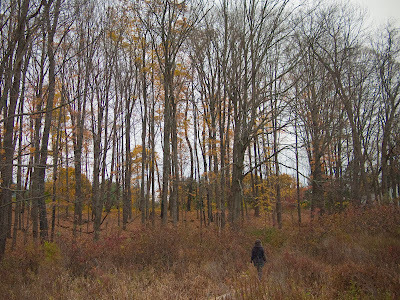 Enough of this to make a skirt, jacket, throw, or poncho would make any lucky seamstress or seamster's dreams come true. For the fiber lover in your life we have the 4) Big Loop Merino bumps ($198). 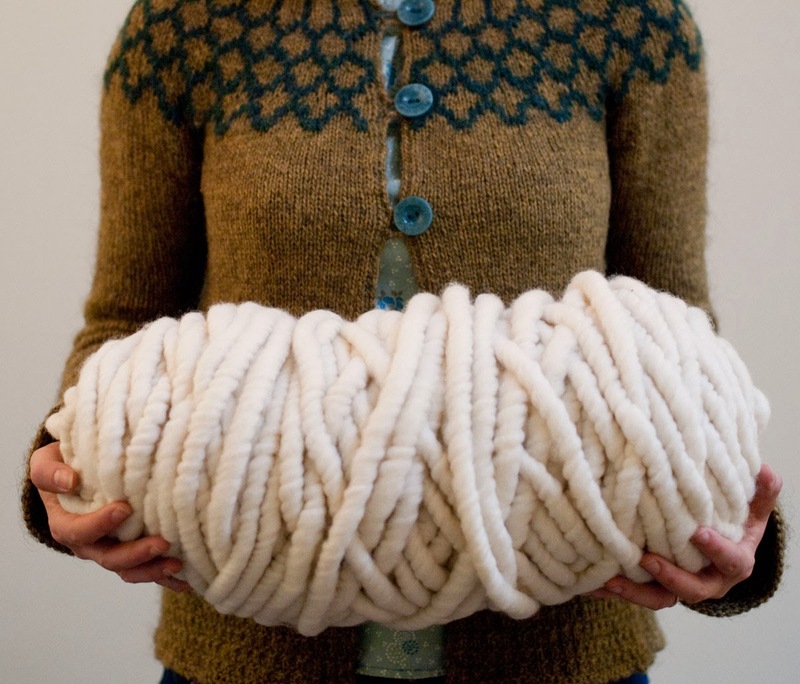 One of these yarn babies is enough for a throw or a couple of extremely large and lush scarves that won't burden the recipient with hours of work. This yarn works up in no time. 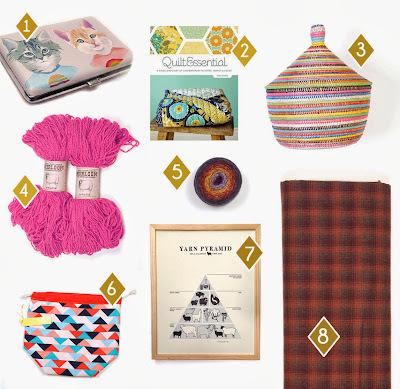 Stayed tuned this week for our Under $50 Gift Guide and Under $20 Gift Guides! 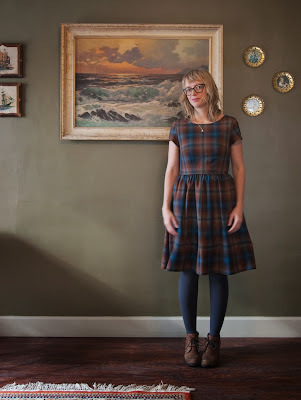 With winter weather finally here, it's the perfect time for a Pendleton wool dress! Christine Haynes recently released her new Emery dress pattern, and it was the talk of the town at Quilt Market. Lizzy House wore one in her soon-to-be-here Catnap fabric, and at Robert Kaufman there was a sample made up in Carolyn Freelander's upcoming Botanics collection. Christine, herself, was there with a whole menagerie of cute Emerys. Needless to say, I was swooning over all these cute frocks and had to make myself one when I got home. 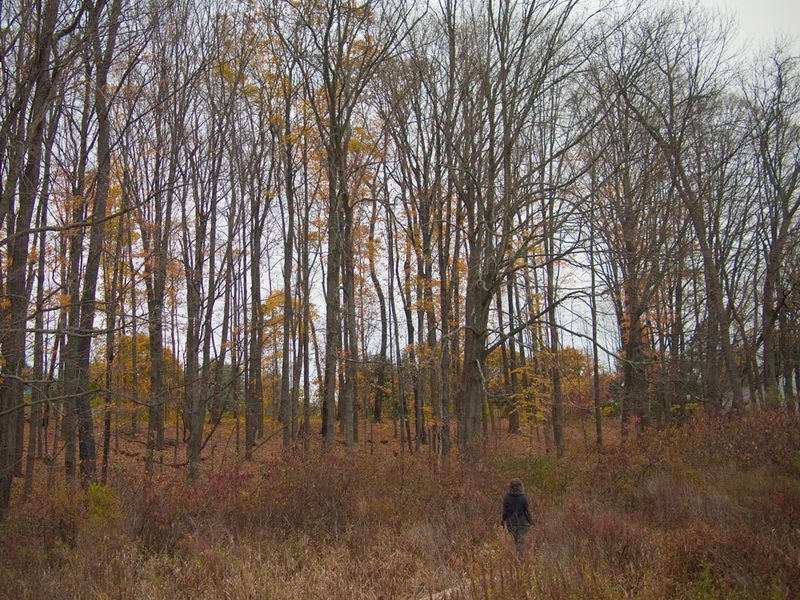 I've been eyeing the Pendleton plaid shirtings for winter garment sewing and had stashed a couple yards of this blue and rust woolly plaid. I was able to squeak this dress out of just two yards of Pendleton by lining the bodice with a coordinating shot cotton. 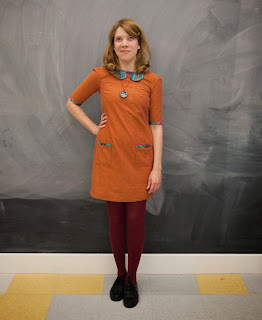 I love the fully lined bodice on the Emery Dress. It makes a neat and smooth fitted bodice, and the lining will be much appreciated as an extra layer of warmth on my new wool dress. The wool was easy as pie to sew with--perhaps even more forgiving than cotton, with the little bit of stretch that wool provides. Winter parties, here I come in my cozy cute wool dress! Thanks to Weathervane Cafe for the photoshoot location! 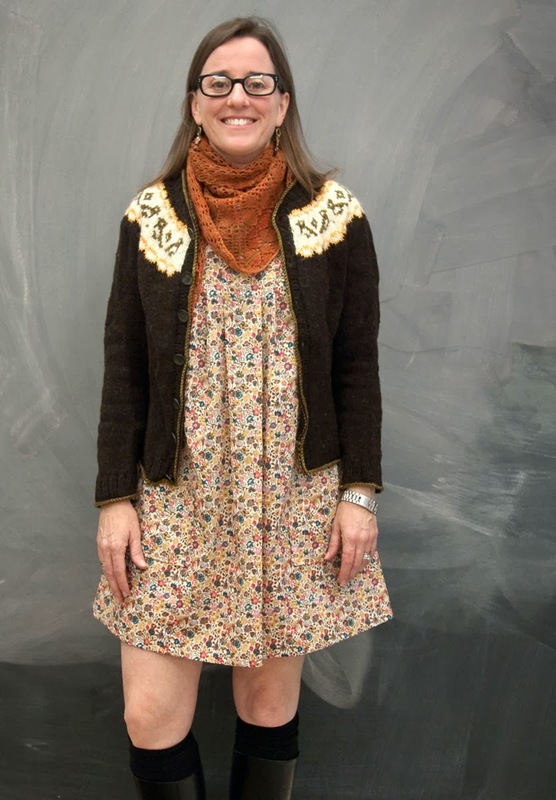 Many of you probably know Sunne - she is a local master-knitter-extraordinaire and runs our weekly Knit Help Nights, as well as teaches tons of classes. 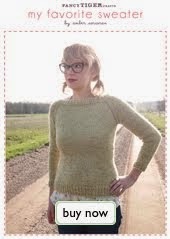 We calculated that she has single-handedly taught over 500 people to knit here at Fancy Tiger Crafts. 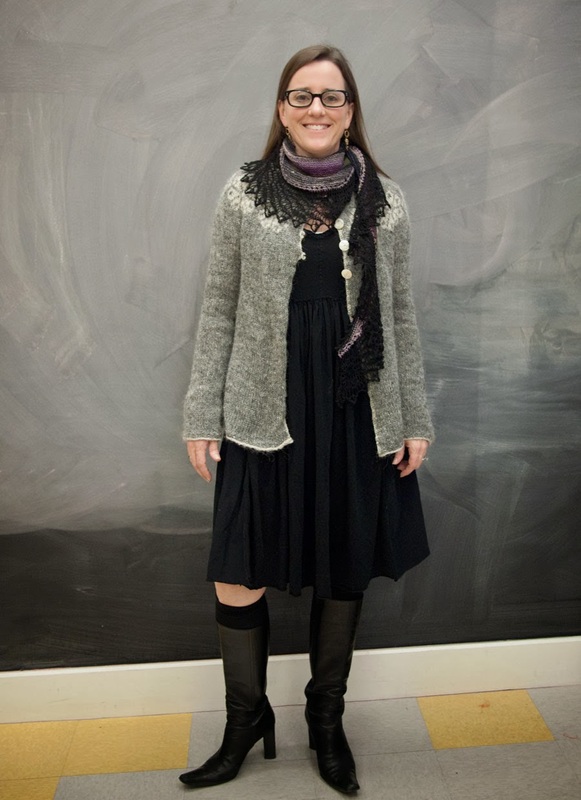 She always thoroughly inspires us with her prolific output of knitwear. Sunne is one of our resident designers, the creator of the Quandary Peak Mittens pattern and also makes the most adorable stitch markers that we sell here at the shop - she is so crafty! Sunne has recently started sewing, and it turns out she is just as prolific with her sewing needle! Now there is no end to the amount of amazing handmade items in her wardrobe. We recently asked her to come in for an epic photo shoot of *some* of her items--she limited herself to things she has made in the last 18 months, and things that are made out of Fancy Tiger products. 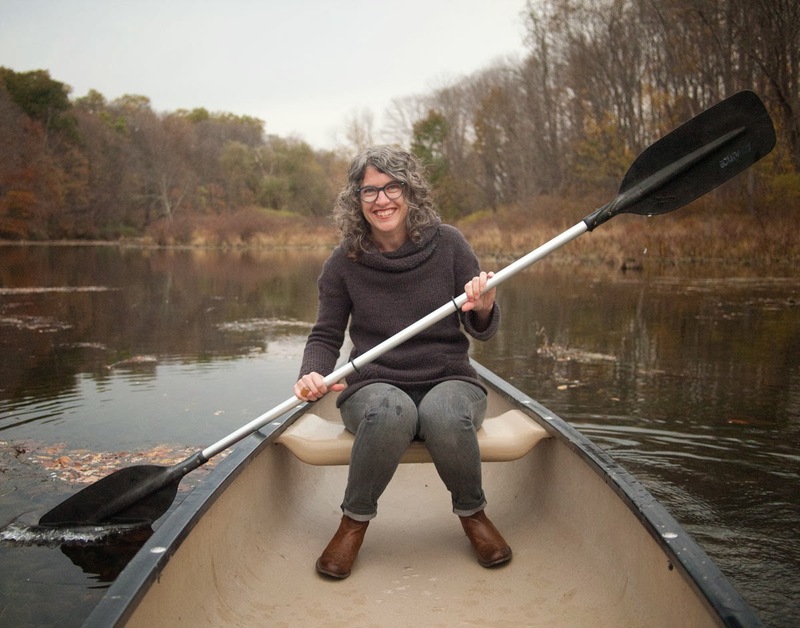 Here she is....we hope you find her as inspiring as we do! In my real life, I am the Vice President of Personal Growth at The Gathering Place, a daytime drop in shelter for women, their children and transgendered individuals. I came to TGP through knitting, starting the knitting program there about 8 years ago and two years later moved onto the staff in programs. I live in and love the Baker neighborhood and our old Victorian house where I live with an amazingly supportive husband (who is okay with me knitting and sewing all the time) and our chocolate lab, Roscoe. I used to own denim stores in Denver, and always loved fashion. I am at the point where now I can choose to knit from a pattern or design what I want, knowing about how it will turn out. 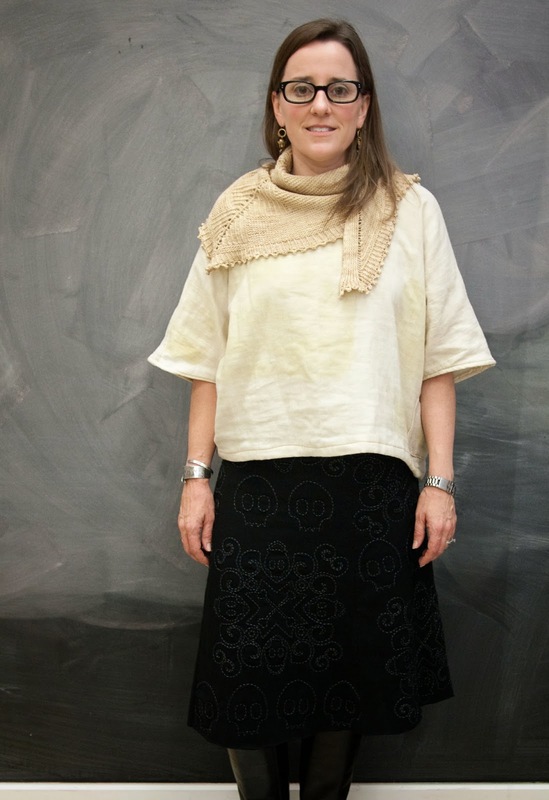 The best part of making my own clothing is that all of it is unique - no one has the skull skirt to match mine or the exact same sweater, even if it did come from a pattern. And sometimes, I trade with other Tigresses, a great way to get those things that I cannot make... My own DIY life couture, that has the added benefit of giving time to think, slow down and appreciate. I have taught at Fancy Tiger for about five years. Just being in the shop is inspiring - there are so many ways each yarn or fabric can become something treasured. I love being able to help people make beautiful things. Knitting is so simple, it's hard. Every time I work with someone and they learn something new or see something that they didn't understand before, its a great thing. 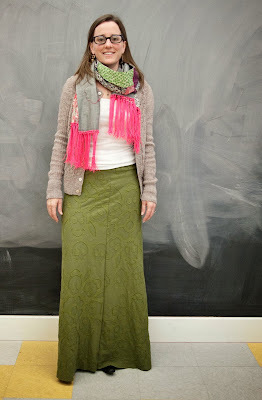 My favorite is when students come to class or I see them wearing things that they have made. 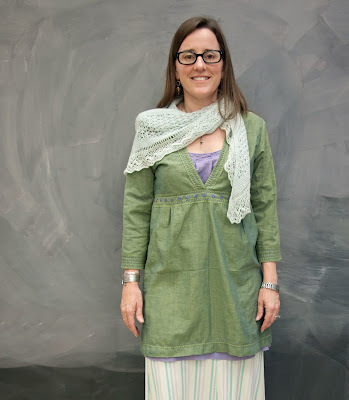 Sunne in her Meanad shawl, Freya Lopi Cardigan and handstitched jersey dress. For me, its less about perfection and more about being proud enough of what you have made, to wear it or give it as a gift. There is something about creating that changes the way you look at things in a positive way. When and how did you learn your crafts? I used to go stay with my grandparents during some summers for a week or two alone. My grandmother taught me to knit and we did embroidery together. She taught me how to knit one dish cloth pattern and told me when I mastered it (knit, purl, yarn overs, decreases), she would teach me other things. We never got to the other things, but she is still knitting those dish clothes for all of her friends. 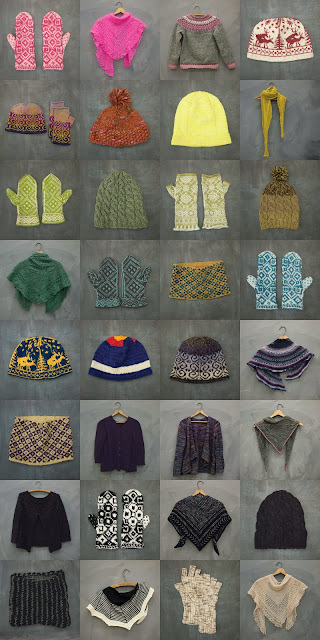 She also made us lots of knit mittens, hats and sweaters growing up. She loves that I teach knitting and is always looking through my projects when I visit. I did lots of other crafty stuff growing up - usually things that were very detailed and took tons of time. I was a quiet child and loved spending time creating things. There was a paper doll house, with 10 rooms, and two dolls that were about 1" tall, with complete wardrobes and accessories, furniture (all laminated with contact paper). There was also a little crochet, potato stamps, painting barrettes, a little machine sewing, painting ceramics and lots of hand sewn felt dolls. It was a very crafty house to grow up in for me. Unicorn, mythical things are so full of possibilities. Thanks Sunne! You are one amazing crafter! We are starting to feel the craft crunch that comes with handmade holiday preparations...and Madelinetosh is here to save the day! With their new A.S.A.P. yarn, quick knitted and crocheted gifts are going to be a breeze! 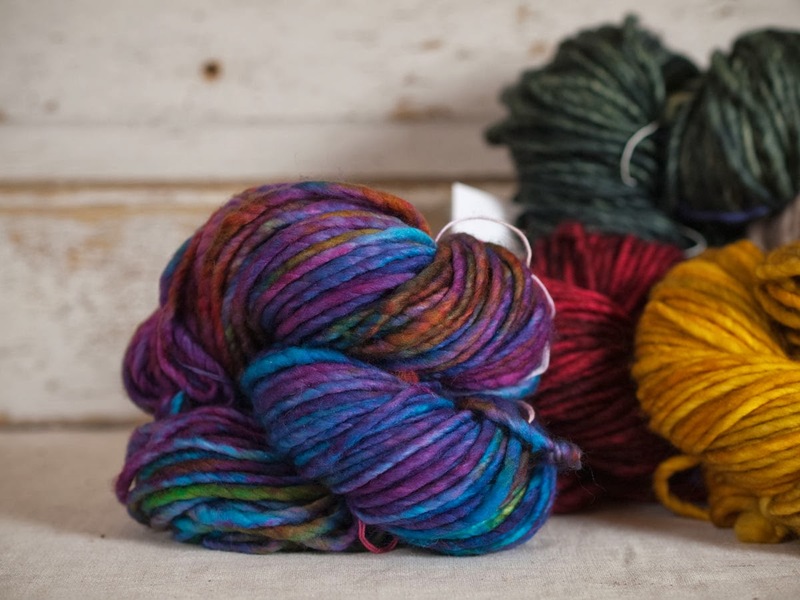 This hand-dyed chunkster comes in the beautiful palette that Madelinetosh is known for. 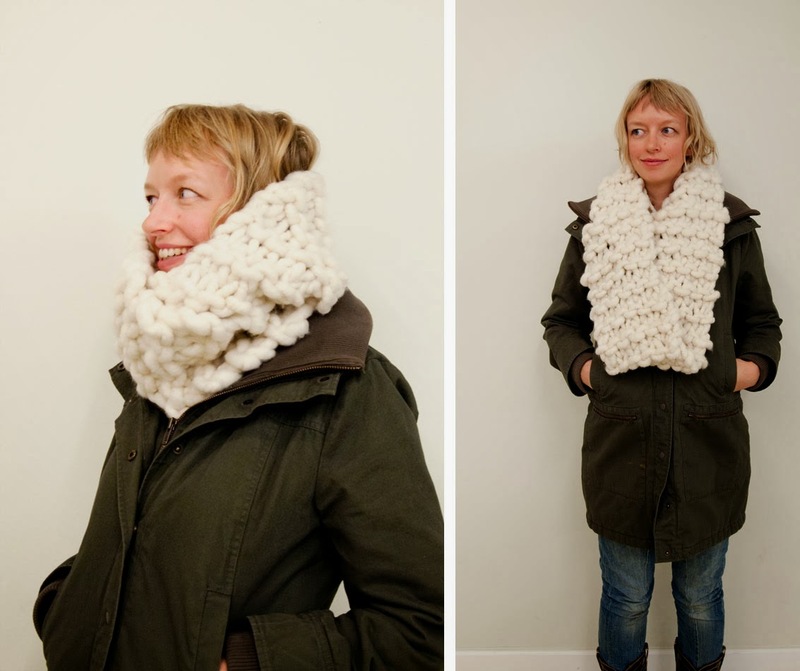 It's perfect for chunky hats and cowls that will knit up in mere moments. 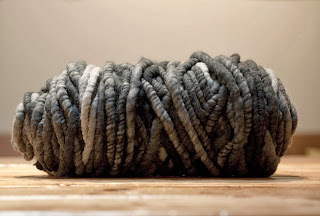 The super-bulky yarn is made from the softest superwash merino, and knits at a gauge of about 2 sts per inch. You'll have all your holiday knitting done in no time! Thanks, Madelinetosh, for saving Christmas this year! 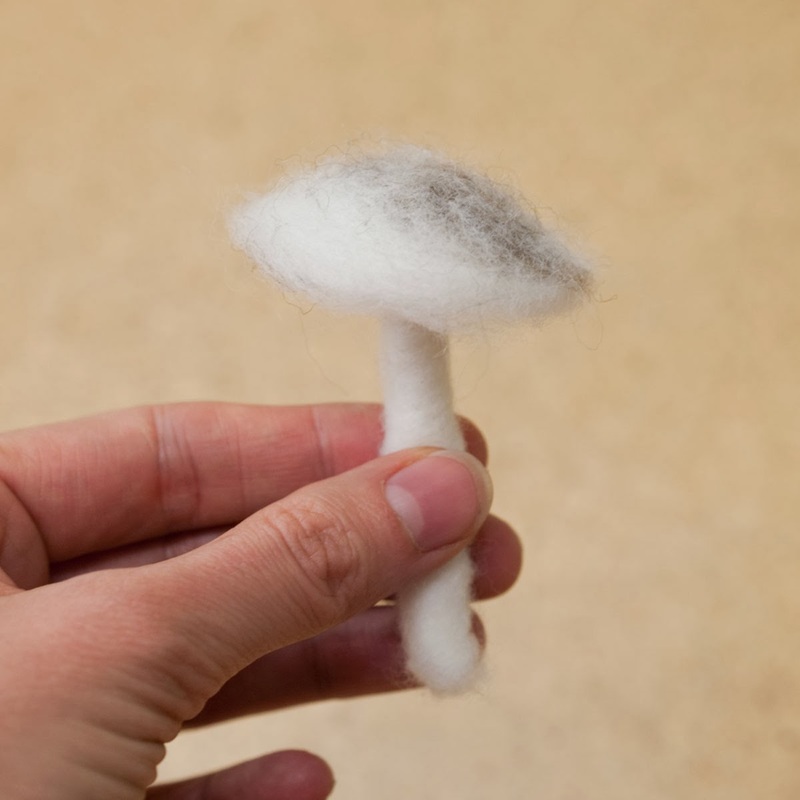 For this weekend, we have a mushroom needlefelting tutorial. Needle felting is a dry method of making felt (matted wool) using a barbed, triangular needle. 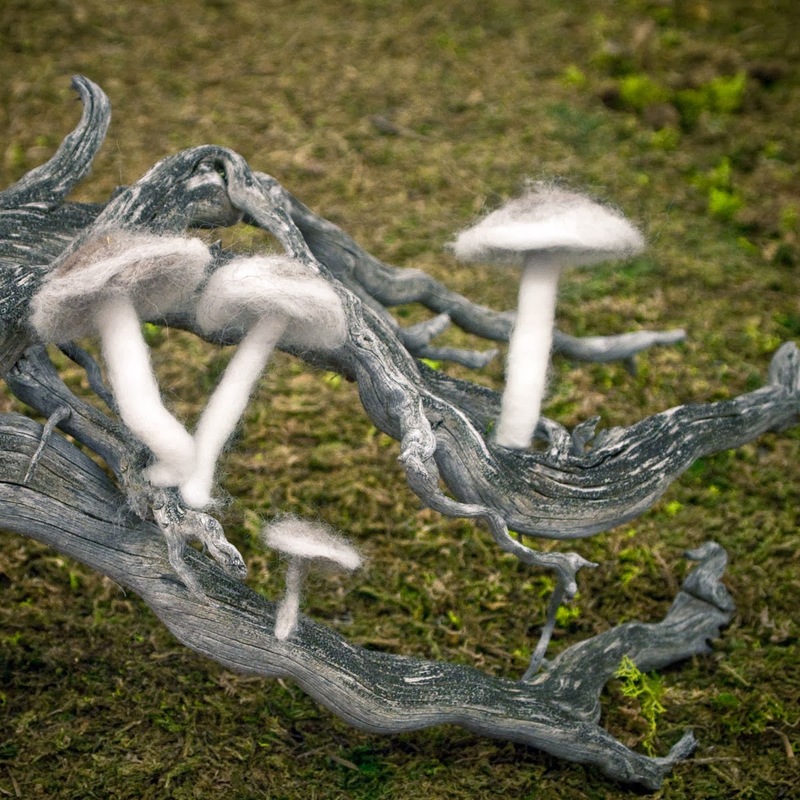 It is easy to learn and can be conceived of as sculpting with wool as your medium and the felting needle as your tool. Roving is the name of the wool that has been cleaned and carded (brushed). Amber is an amateur mycologist, so for this project she was inspired by Clustered Bonnet mushrooms. If you live in the Denver area, we will be doing a free make-and-take of this craft project at the Clyfford Still Museum from 5 - 8pm tonight. For this project you will need: (all materials are available at Fancy Tiger Crafts) Our finished mushrooms are 1" - 3" tall and the caps are about 1" - 1 1/2" in diameter. One ounce of fiber will make 5 - 6 mushrooms. Step 1: Make stem. 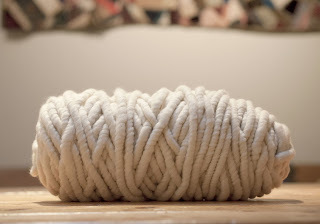 Pull a piece of white roving - about 1" by 3". You can just pull it apart gently with your hands - no need for scissors. (If it is hard to tear, move your hands further apart along the roving and it is easier to break.) Wrap this strip tightly around your chopstick. Now pull the roving off of the chopstick - it should already look stem-like without any needle felting. Place this on your foam and needle felt it while turning it over so it is even on all sides. 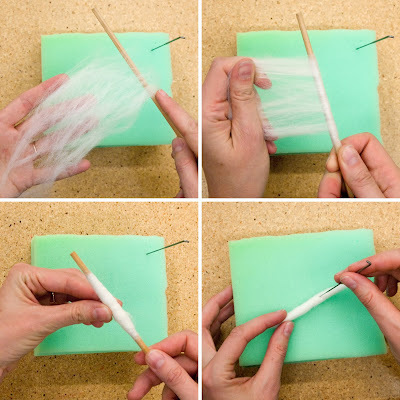 To needle felt, poke the needle into the stem about 1/4" to ½" deep and at a 90 degree angle. Leave one end fluffy - this fluffy end will be used to attach the stem to the top. Step 2: Make cap. 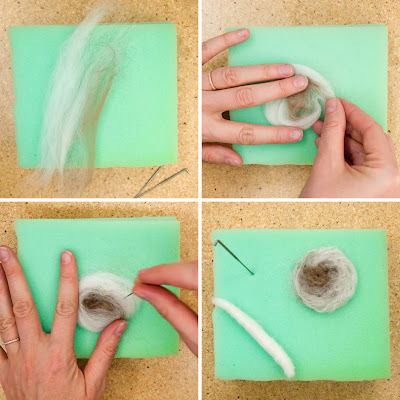 Pull a small amount of white roving and lay it on your foam. Repeat with the grey and then brown rovings, pulling a smaller piece for each color (brown being the smallest). Now wrap this strip of neutral roving rainbow into a spiral. The white should end up on the outside with the gradient to brown going toward the center. Now needlefelt this round shape until it holds together - you should end up with a flat disk. Step 3: Attach stem to cap. First you can shape your cap with your hands so that it has a dome shape instead of a flat shape. Next, you will attach the stem to your mushroom cap by poking the fluffy end into the underneath of the mushroom top. Poke it all around until the stem is firmly attached to your mushroom. Yay! Now repeat and vary your size for the ultimate cute factor. For a lovely display we attached our mushrooms to a real log using hot glue. 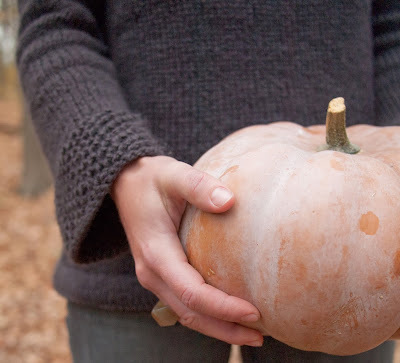 This would make the perfect centerpiece for your next foraged meal with friends or family. 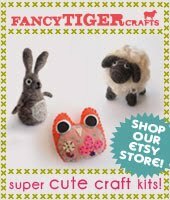 If you want more needlefelting, be sure to check out all of our awesome kits! 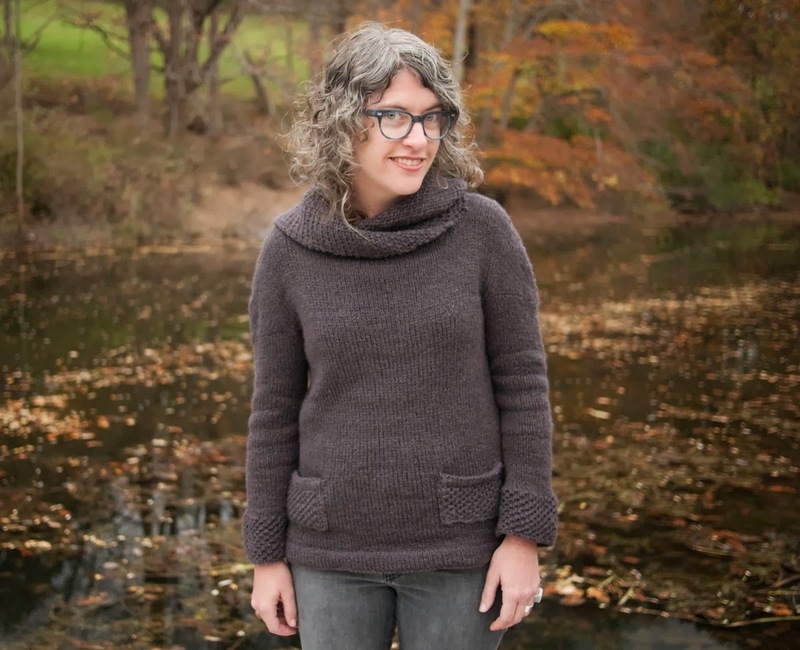 Ysolda Teague has just released a new book, The Rhinebeck Sweater, and it's my favorite knitting book this year. It is a tradition for most knitters to knit a sweater to wear when they go to Rhinebeck Sheep and Wool festival. 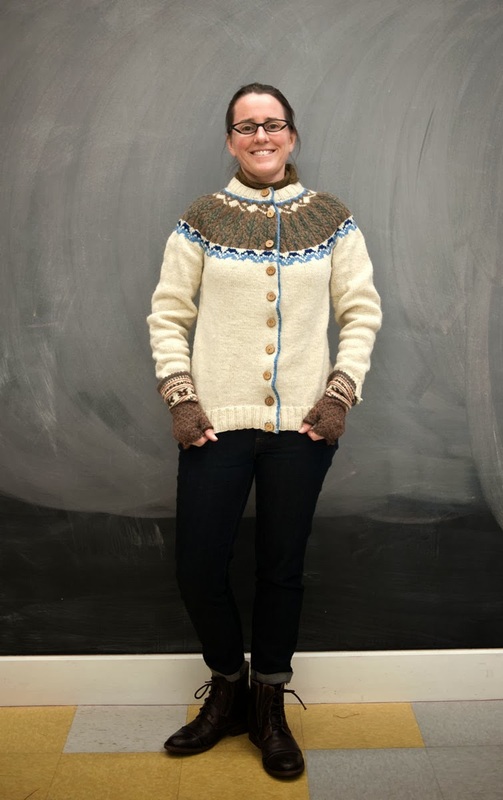 Ysolda turned this idea into a beautiful book with 12 sweater designs by 12 different designers (herself included). 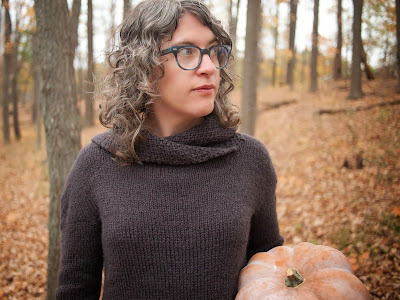 When Amber and I decided to go to Rhinebeck this year, I knew I had to make a sweater to wear so I chose to make one from Ysolda's book. This pattern is Pippin by one of my favorite designers, Gudrun Johnson. Amber and I might have some connections so I was able to get my hands on the this pattern before the book was released. That being said, I knit this up in record time to get it finished in time for Rhinebeck and before Spinzilla started (which took me away from my knitting for a week). 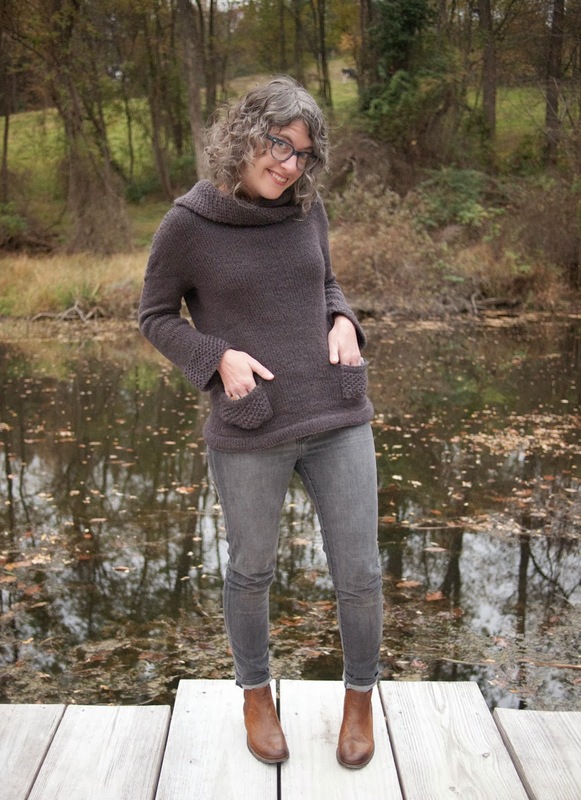 All the sweaters in The Rhinebeck Sweater feature farm-y yarns that are representative of the yarns you can purchase at the Sheep and Wool festival. I knit this up in our Heirloom Romney yarn which worked so well for this pattern. 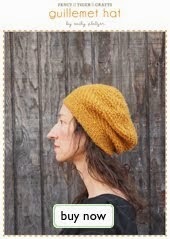 The worsted weight longwool Romney has great stitch definition - perfect for the brioche details. I used the deep-purple Elderberry and the sweater took 5 skeins for the size 33 1/2". There are so many things I love about this sweater, I don't even know where to start. First, there is the unusual sleeve construction. The shoulders are created with short-row shaping and then the sleeve is knit down from there - interesting to knit and soo flattering to wear!! I love the fluffy brioche stitch details at the collar, cuffs, and pockets. The large fluffy brioche cowl neck was picked up and knit last - it really gives the sweater a striking look, and you know how I feel about large cowls...(insert heart eyes). Professional details such as the bottom folded hem and kitchener seams make this sweater look fantastic and sophisticated. I can tell you right now, you will be seeing more sweaters from this book knit up by yours truly - its a beautiful collection. The Rhinebeck Sweater book is in stock now so you too can start knitting up the sweaters of your dreams! 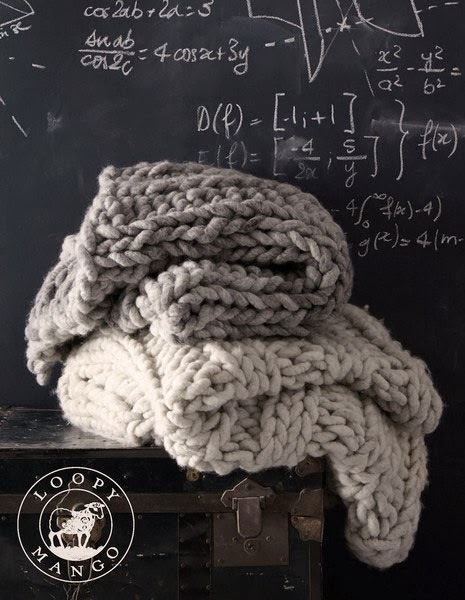 Big Loop Wool from Loopy Mango is Here! Insanely bulky Big Loop Wool has arrived from Loopy Mango! 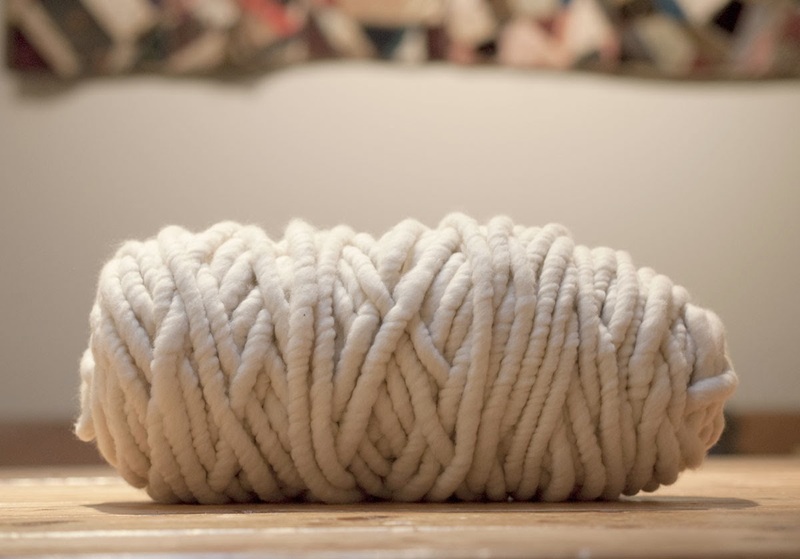 One skein of Big Loop weighs a whopping 40 ounces (2.5lbs), and is enough to make a cozy 40"x 28" throw blanket in just 3 hours, or a 32" crocheted circle rug in no time! Whip up the Eternity Cowl in an hour--or three of them in three hours, because one skein of big loop will make three cowls! 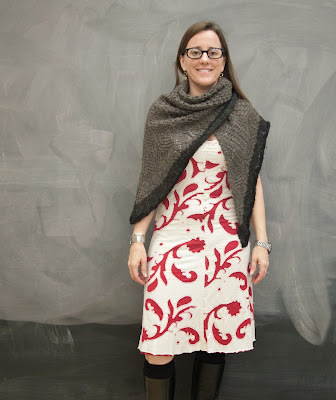 Check out Loopy Mango's free patterns for Big Loop Wool for more inspiration. Chambrays and Shirtings and Jerseys, Oh My! Garment sewists, rejoice! Loads of new garment-friendly fabrics are here! We have been up to our elbows in exciting shipments this week and we've finally got it all unpacked. New homespun shirtings are here and we love the details, like dots, stripes and cross marks, woven right into the fabric. We can't wait to make Tovas and Esmes and Laurels galore from these great fabrics! 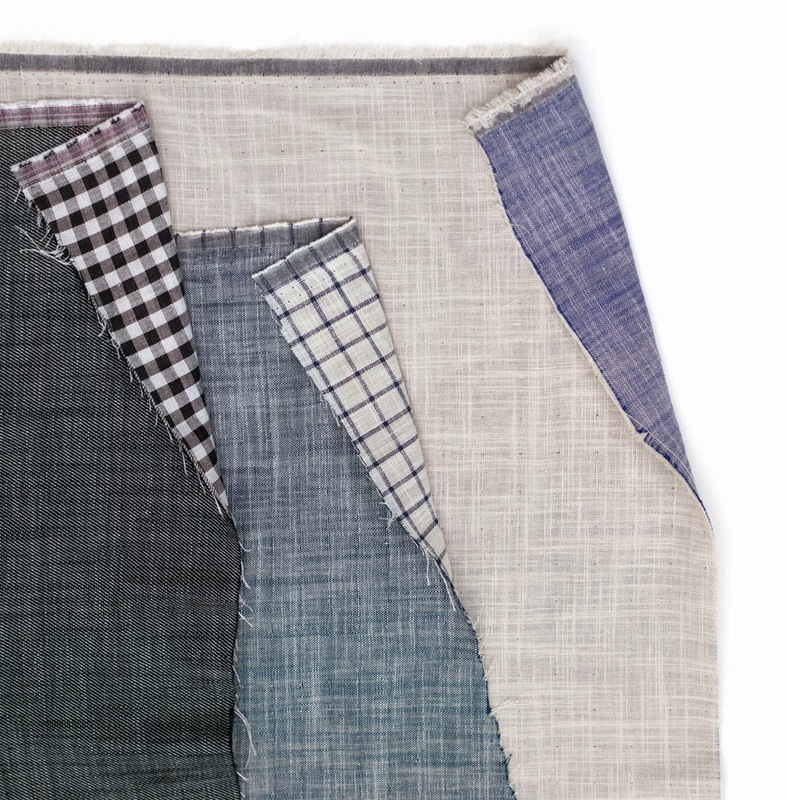 These double-sided fabrics feel like a double gauze and look amazing on both sides! They would be perfect for reversible garments or bags. We are thinking the simple Wiksten Tank with flat felled seams would be perfect! Omg, batiks? You might feel like our shop is a desert when it comes to batiks, but we are batik-curious, that's for sure. 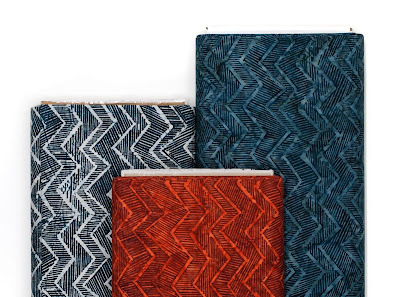 When we saw these zig zag batiks, it was over. Chevron batik Staple Dress? Yes, please! 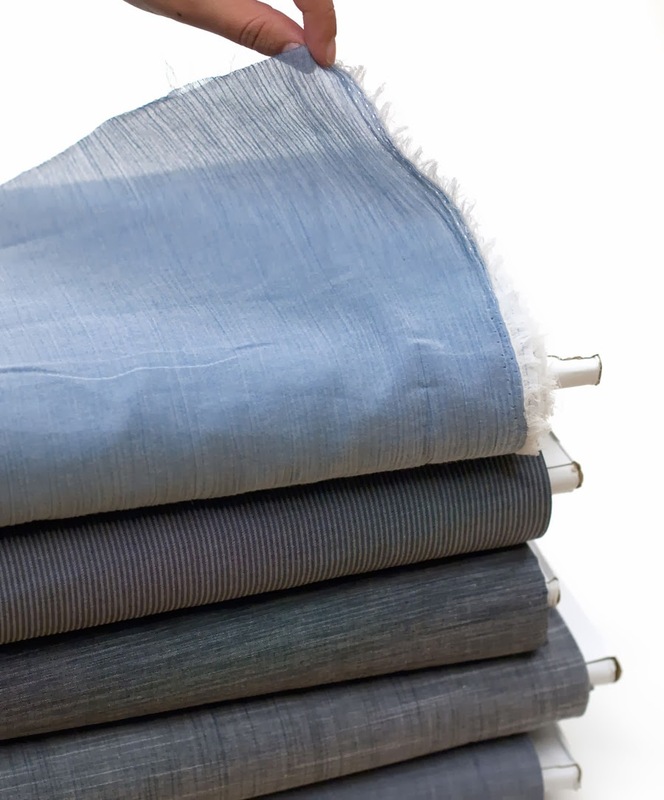 Featherlight chambrays are here--perfect for ethereal blouses or dresses. The Chantilly or Clara Dress would be lovely! There is a rainbow of new jerseys here, too! We hope to be sporting new Lolas and Leggings in these babies soon. Better Know Two Crafters: Laurel-Along-ing with Becky and Sara! 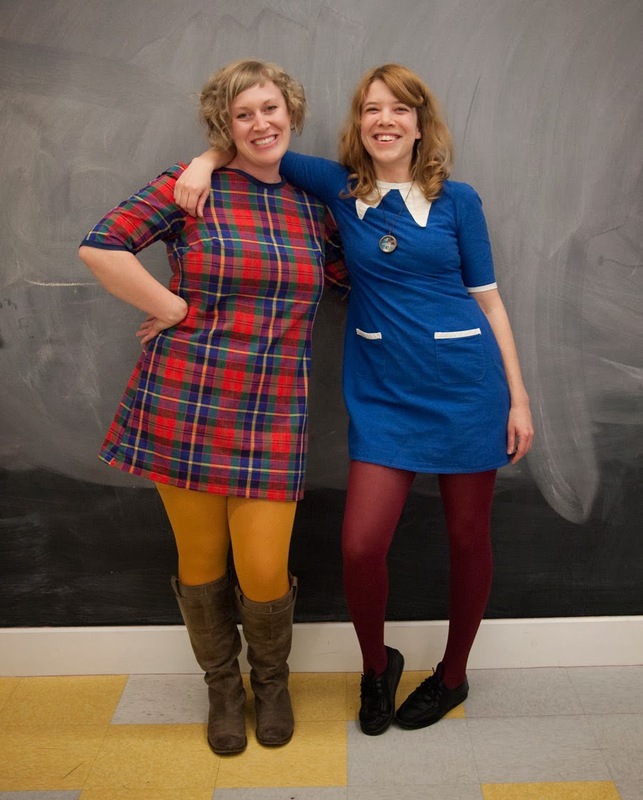 Two of our favorite ladies have been spending a lot of time in our sewing studio lately during Open Sew Nights! 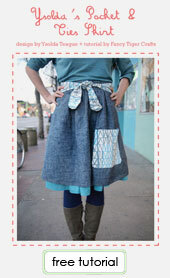 They've been on a Laurel-making adventure, whipping up cute Laurel dresses and tops left and right. You may know these presh ladies from around town--Becky is one of the Fancy Tiger Clothing folks, and the woman behind Becky's Buttons & Things. 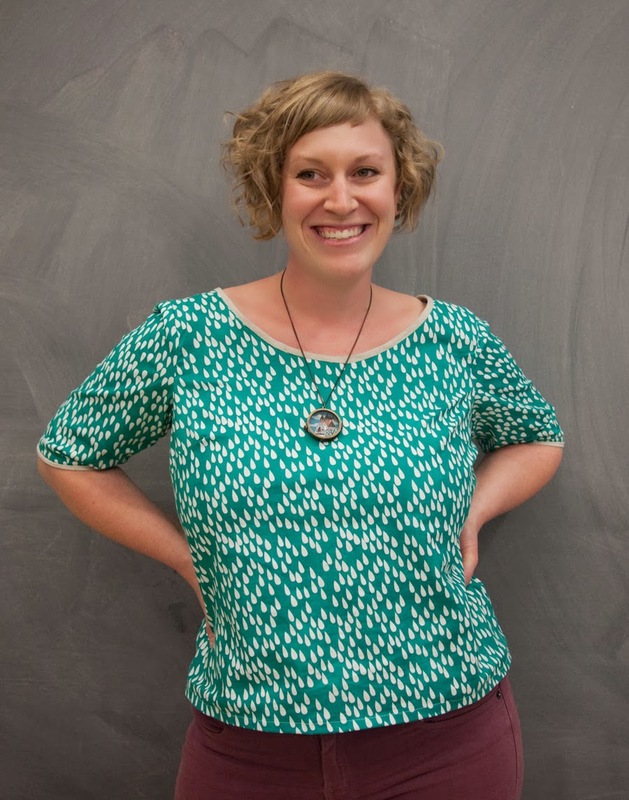 Sara is one of our favorite local artists (although Denver stole her away from her homeland of Canada). In addition to their love of making Laurels, Becky and Sara also join forces making miniature illustrated worlds with their collaborative Diorama Lockets. Tell us about your crafty selves. Becky: I am a compulsive crafter. I try to create something every day whether it be something for myself, a gift, or for my business (insert shameless promotion here...) I love to crochet, sew and mainly work with miniatures. 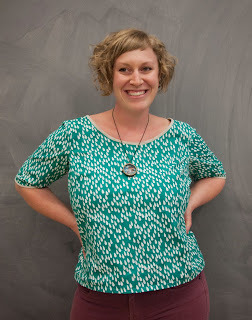 Sara: I'm an illustrator and I like to draw and paint people. I'm new to sewing, but I used to do a lot of felt applique, and I have some English paper peicing for on the go. Tell us about the Laurels you've made. Becky: This was my first time sewing with a pattern. Sara encouraged me to try the Laurel pattern from Colette and now I'm addicted. Sara: I made three Laurel dresses. It was fun adding extra details like contrasting bias tape and applique collars. How did each of you learn to sew? Becky: I came from a long line of crafters. My grandfather taught arts and crafts at a prison in Philidelphia and, even though we never met, he's been a huge inspiration of mine. Sara: A long time ago I used to hand sew applique bags. Then I started making small alterations on my home sewing machine. 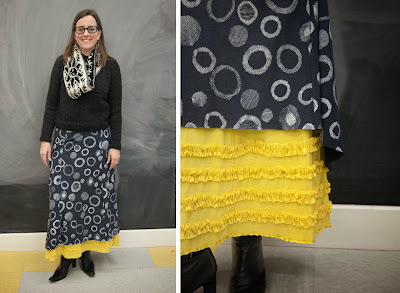 Now I want to learn how to follow patterns--I'm addicted to Colette Sewing Patterns. Becky: I love all animals, but I live with two cats. Sara: My boring answer is dogs. Visually I like giraffes because they have big eyes and long eyelashes. Thanks Becky and Sara! Happy crafting! 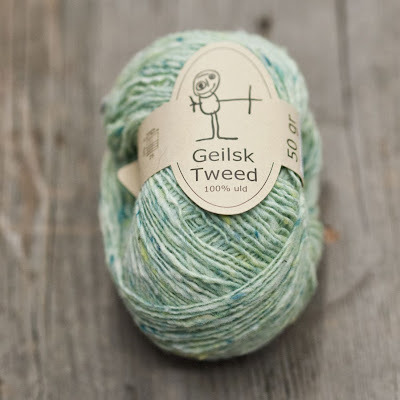 Geilsk Tweed Yarn is here from Denmark! It's adorably nubby--it's Danish Geilsk Tweed! 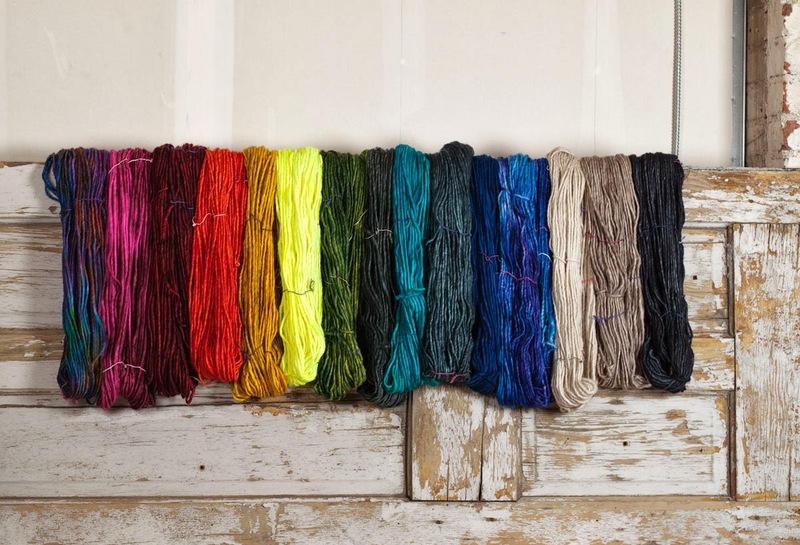 This single-ply sport weight yarn is milled in magical colors that we can't resist. 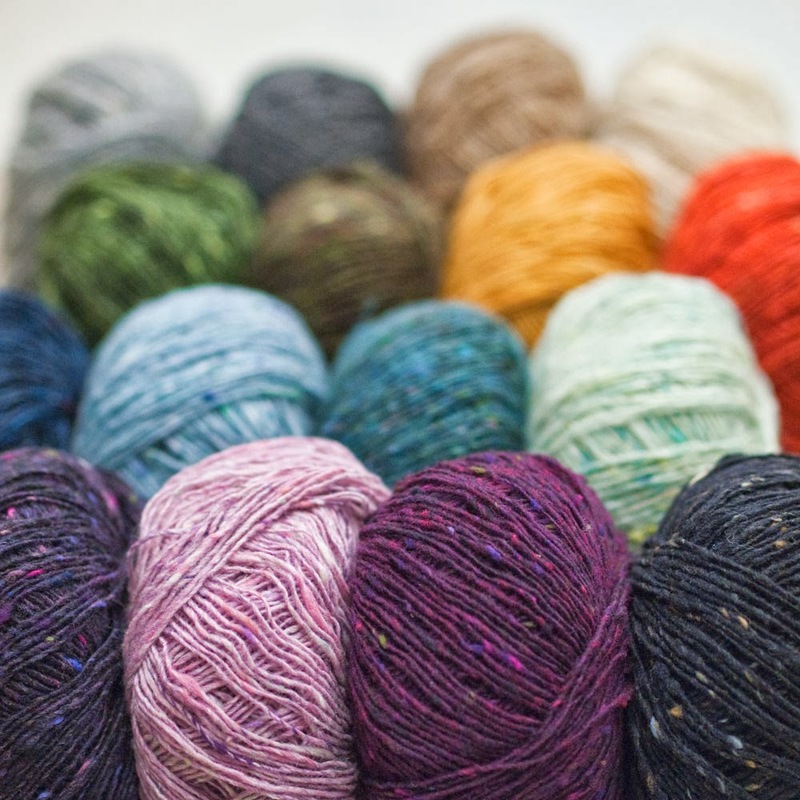 We see classic shawls and cardigans--and with this palette of hues that are made for each other, colorwork would be perfect from these woolly balls of goodness.